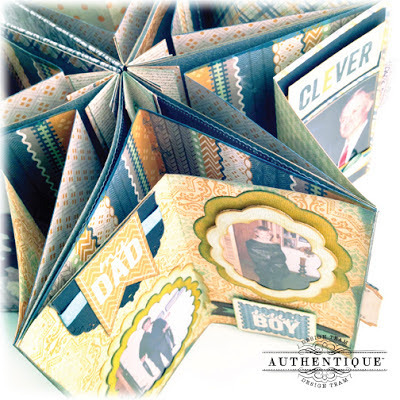 Talk about the PERFECT paper for Father's Day- that's exactly what I thought when I laid my eyes on the "Strong" paper collection from Authentique Paper™! After taking in all the amazing papers and colors I knew that I had the perfect beginnings for creating lots of different projects. 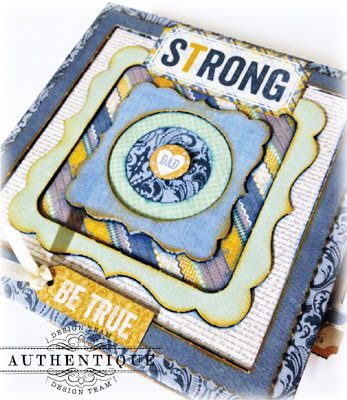 Since the colors and patterns blend together so naturally with the "Strong" collection I thought that this would be the perfect paper for creating a Star Book for my Dad for Father's Day. I should preface this with the fact that it's taken me years to talk my Mom into letting me borrow our old family pictures shoved in a variety of different shoe boxes in the back of the coat closet. And I think that it took longer to sift through the pictures and scan them then it did to make the actual book! The cover of the Star Book uses "Mighty" as the paper base with the "Frames and Corners" die cut paper accents used for the centerpiece of the book cover. I used dimensional tape to raise every other layering piece of the die cuts. 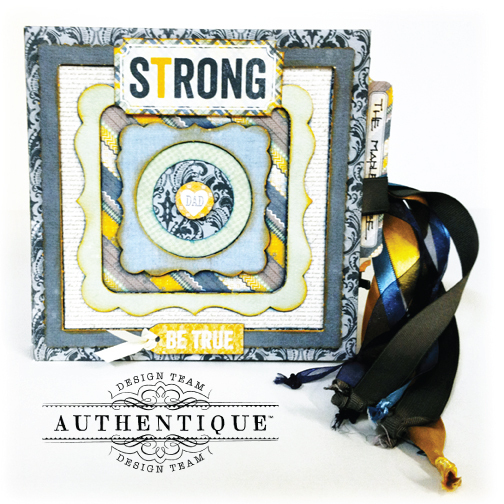 "Be True" is from the 12 x 12 sticker sheet with "Strong" taken from the "Foundations" 12 x 12 cut-apart paper sheet. All the pieces were edged using Imagine Crafts®/Tsukineko® Memento Luxe™ pigment inks in Nautical Blue and/or Toffee Crunch. PAGE ONE The picture on the left is of my Dad in high school (and I still have the sweater he wore in the picture!) and on the right is my Dad at his second home- the golf course. 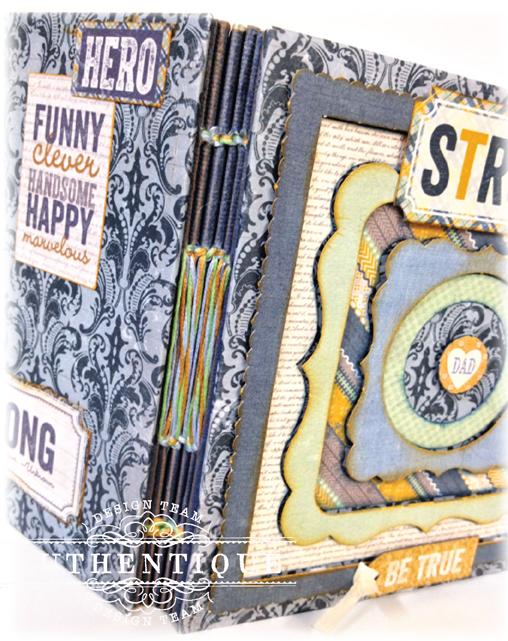 "Hero" was used as the background paper for this page, with solid colored die cut frames using Spellbinders'™ Nestabilities® Imperial Gold "Gold Labels Four" die set. "Handsome" (like Father like Son, couldn't resist!) was cut out from the "Foundations" 12 x 12 cut-apart paper sheet. PAGE TWO Since there's three of us boys in the family, I figured that I'd better feature all of us for my Dad or I'd never hear the end of it from the other two! The background of this page features the "Handsome" paper. The left side of the page uses Spellbinders'™ Nestabilities® "Cogs" die set to create the frame for the picture. The car and hammer are taken form the "Stamp Blocks" die cut paper accents sheet. For the right side of the page I used an x-acto knife to cut out the inside of the frame on the "Handsome" paper and placed the picture underneath. "Wonderful You" is already printed on the "Handsome" paper which fit perfectly with this page and saved me some time! "Like Father Like Son" sentiment and the heart next to it are both from the "Components" 6 x 12 sticker sheet. It's a little difficult to see in this picture but there is also a pull out tab ("The Maple Tree" is the top of tab) that pulls out between page one and two. 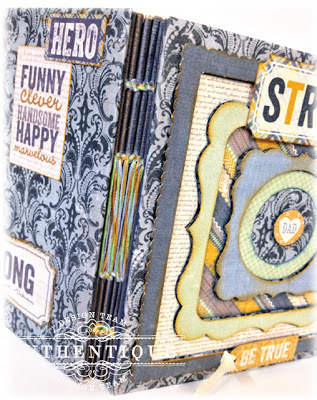 I used the "Hinges and Tabs" die cut paper accents to create the tab at the top which pulls out more pictures. LOVE all the hidden fun that can be created with a Star Book! PAGE THREE The background for this page uses this amazing pattern from the "Handsome" paper- I have to admit that if I could get this pattern on tiles or wallpaper for my house I would be in heaven! 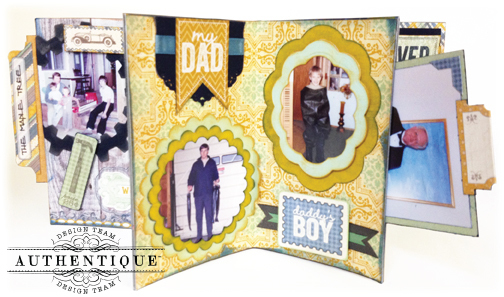 The left page has layers of solid cardstock (edged with Memento Luxe™) cut with the Spellbinders™ Nestabilities® "Classic Scalloped Circles Large" die set beneath a picture of my Dad holding his catch of steelhead from a fishing trip. 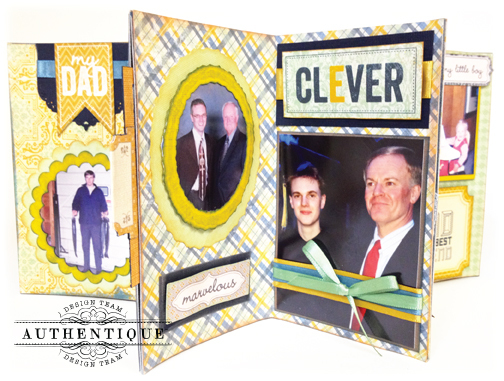 "My Dad" is from the "Components" 6 x 12 sticker sheet over coordinating ribbon and a solid navy cardstock piece cut with Spellbinders'™Spellbinders'™ Nestabilities® Imperial Gold "Gold Labels Four" die set. The right page has a picture of me standing in my Dad's fishing boots with layered pieces of cardstock cut using Spellbinders'™"Big Scalloped Ovals Large" die set. "Daddy's Boy" is taken from "Stamp Blocks" die cut paper accents over a couple layers of ribbon. This page also features a pull out tab card as well. PAGE FOUR "Enduring" paper is the background paper for this page. The left page has a picture of my Dad and I from a cruise we took a few years ago above layered cardstock pieces using Spellbinders'® Deckled Ovals die siet. "Marvelous" is taken from the "Details" 12 x 12 sticker sheet. The right page has a picture of us at my graduation topped with some ribbon in my school colors. "Clever" was cut from the "Foundations" 12 x 12 cut-apart paper sheet. PAGE FIVE "Enduring" is the base paper for this page. The top left page uses the "Enduring" border sticker taken from the "Details" 12 x 12 sticker sheet page topped with the bird sticker taken from the same sheet. Below is a picture of my Dad measuring my height on my 16th birthday. 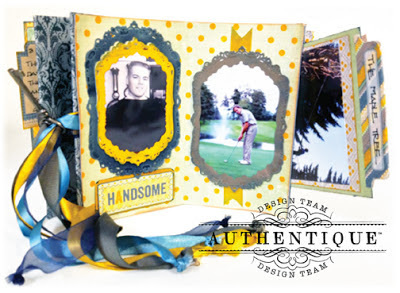 Ribbon is woven through the holes that were cut using Spellbinders'™ Nestabilities® "Beaded Ovals" die cut set. The right page has a picture of me on my 2nd birthday topped with "My Little Boy" from the "Details" 12 x 12 sticker sheet. "My Dad Is My Best Friend" was cut from the "Foundations" 12 x 12 cut-apart paper sheet. PAGE SIX This page showcases the "Hero" paper for the background. My first sip of coffee is the picture on the left page (explains everything!) and is layered under the "Mighty" note piece taken from "Foundations" 12 x 12 cut-apart paper sheet. I used this piece because I cut out the actual note field of this piece and used it as a frame for the picture! "Oh So Sweet" sticker is from the "Details" 12 x 12 sticker sheet, along with "My Boy" and "My Son" on the opposite page. "Daddy's Boy" and "You're The Best" are both from the "Components" 6 x 12 sticker sheet. The right page has the picture of me on my first day home from the hospital with my Dad and older brother cut out to fit inside of the framed border of the "Mighty" note piece from the "Mini Notes" double-sided die cut sheet. This is a tab that opens up with some writing on the backside and features one of the sentiments from the "Titles and Phrases" die cut paper accents sheet underneath. 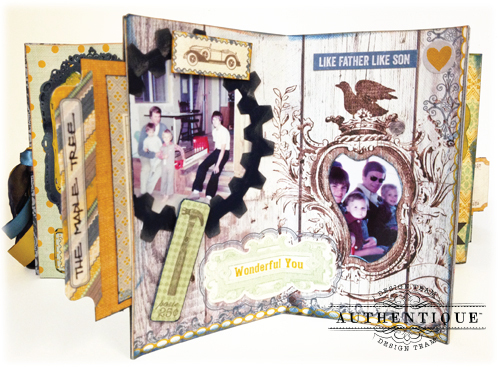 The "Dad" postage stamp is from the "Stamp Blocks" die cut paper accents sheet. This is a close-up of the stitched binding that was used to create this Star Book and also shows some of the decorative elements that I added to the back cover of the Star Book as well which stand out so nicely on top of the "Mighty" paper. Hope this gives you some inspiration to create your own mini book for your keepsakes! The goldy yellow and blue look great together--perfect for a man. I really like your project, who wouldn't!! What a great keepsake. 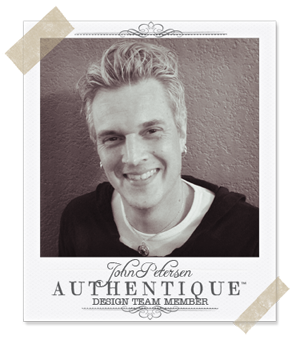 Such an amazing project, John! The detail on each and every page is just out of this world! Wow, an amazing album, it looks fabulous. I must come back to take another look. The star albums are amazing! Your father will love your work! Fantastic combo of colors~awesome project! John...I love this idea! Wow, this is amazing! Wow! What a labor of love - amazing! You put colors together I'd never have dreamed of! These mini albums are such great gifts and a labor of love. This one is fantastic.